Mr. Rippy was appointed to the UNCW Board of Trustees by the Senate President Pro Tempore to a four-year term ending in 2021. He is Chair of the Audit, Risk and Compliance Committee, and serves as a member of the Business Affairs Committee, the Educational Planning and Programs Committee, and Executive Committee. Mr. Rippy earned his undergraduate and graduate degrees from East Carolina University. 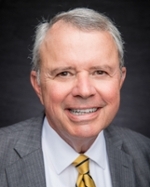 A former chair of the Cape Fear Community College Board of Trustees and member of the UNC Board of Governors, he has also served on numerous advisory and advancement boards for both UNCW and ECU. An accomplished business executive, entrepreneur, and international industry leader, he has served in leadership roles with the Wilmington Chamber of Commerce, the Cape Fear Visitors Bureau, Wilmington International Airport, and the Friends of Airlie Gardens. He and his wife, Jennifer Rippy, reside in Wilmington.